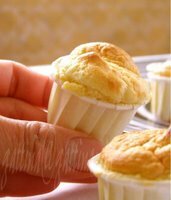 These souffle-alike cakelets have three features: First, they are only bite-sized, the cups right here are those for holding ketchup at fast food places. Second, I added a pinch of masala garam in the batter. Please go look at Shaheen's garam masala and see how this mahogany charm gets rid of an egg-y smell but leaves a very subtle fragrance in her cakes. 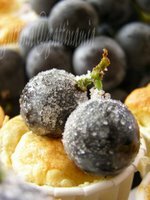 Third, I chose to use American Concord grapes which are commonly used in making jelly (or English call it jam) and wine. My husband told me that in the area we live used to have many Concord grape growing wild. To me they taste sour although a couple of web-sites sort of deceive the fact by saying they're tangy. But one thing for sure, Concord grapes are very adorable and extremely aromatic, then I understand why they become one of the popular table grapes. To kick out the sour taste, I simply frost them: lightly beat one egg white and brush on the grapes, sprinkle granulated sugar, keep them in the fridge until serve. 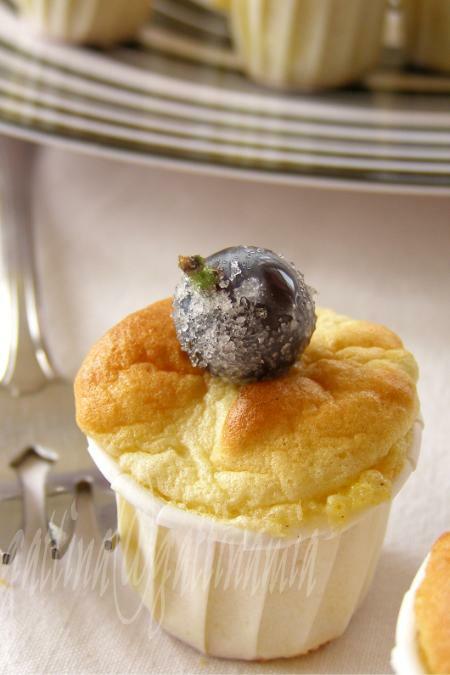 In a large mixing bowl, combine mashed potatoes, ground almond, garam masala, yolks and grapes. Set aside. 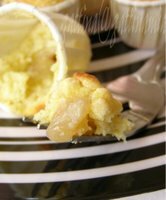 In another bowl, add a pinch of salt and cream of tartar in egg whites, beat until soft-peak form, add sugar and beat close to stiff-peak. Gentle fold the white foam into the yolk mixture until just combine. Garnish with frosted grapes, serving immediately. What an interesting recipe! I'd have thought about using potatoes and grapes together. Sounds really good. And the pictures are as always great. Those look wonderful!! I made muffins yesterday but they were terrible. Your little cakelets look very tender and light. I like the little paper cups you baked them in. You're so creative! 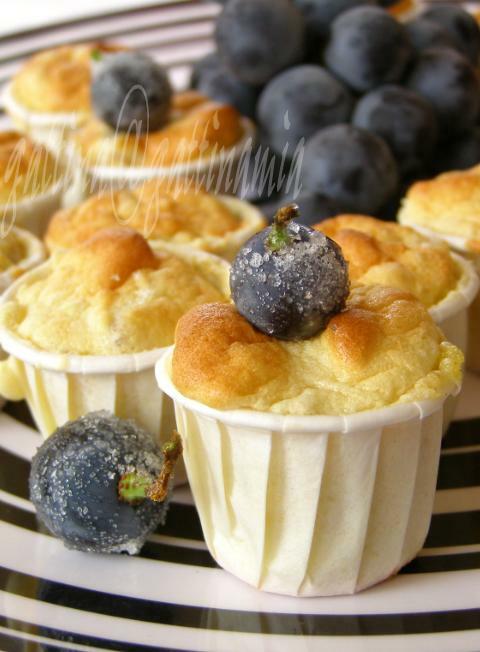 Souffle-alike cakelets are apt name, Gattina!! What a beautiful presentation! !Very light and pics are brilliant! Wow what a creative recipe, the cakelets look so moist almost like a sponge. And I do like concord grapes. I agree, you are so creative. And such a good photographer too. When I was a kid we had concord grapes growing in our neighborhood. The neighbors would let us pick as much as we wanted, and my mom made grape juice from them. Oops, Gattina I'm at school and I forgot to log out of my students blog, so will you not publish that last comment and this one so people can't follow it to find the student's blog. I will type it again logged in as Kalyn. It's true, you are so creative, and such a good photographer too. When I was a kid we had concord grapes in our neighborhood and the neighbors let us pick as much as we wanted. My mom would make grape juice. Interesting spice mix. Nice creative use of it. gattina:Wowo...what a combination! I have to try this, it has piqued my curiosity..no problem in linking my spice mix. always a pleasure to see new uses of it. a really unique combination and sure sounds delicious too. As always, great presentation too. Burcu, you're right, I found the combination quite intrique in the beginning. Potato produces a very moist crumb. Asha, thanks for your compliment! Kalyn, oh thanks for your kind words! I haven't seen grape vines in close distant, wish I had one as I like to experiment wine making. Peabody, the spice mix is GREAT! From now on I don't think I'll add rum/brandy in batter. Shaheen, thank you again! Your garam masala is a keeper! Angie, thanks for your encouragement! They are so cute... I like a lot the first photo. As usual, your photos are outstanding. The recipe is so intriquing - how did you come up with such a unique idea. I love the use of condiment cups - too cute by far!!! Gattina, these are fascinating! They sound delicious (and I had a chuckle at the fact that, if you don't have garam masala available, you can just throw in some rum...love that! ), and the photos are gorgeous. Thanks for sharing these! Oh ghee what a great idea! They look adorable. Reminds me of the easy bake oven minature stuff I used to love as a kid. I'm sure they taste better than what came out of my easy bake oven though.